The Cosmic Disk is a galaxy that houses the majority of the most advanced inventions and constructions of the long left ancient hyper-advanced race, known as the Shapers. As a location of extremely high priority, it does not only contain vast amount of technology artifacts, facilities, structures, blueprints and other objects of interest but also a huge set of nearly unbreakable safety measures that guarantees that races not being sufficiently advanced can not stay in existence in it indefinitely. Despite said safety measures, certain space-travelling races could reach its body, while some rose up on its planets as a result of evolution. At the time of the Terminus Nation Invasion, four main and thousands of minor sentient races inhabited it, waging gigantic waves of wars, technologic revolutions, collapses and gold rushes. The Cosmic Disk is the location of the majority of the stories of Terminus Nation Universe. The Cosmic Disk got its name by its inhabitants after its unusual shape and structure: being a special type of ring galaxy, it has very small amount of stars and solar systems scattered in its body - the majority of the cosmic matter is concentrated around its gravitational center and around the edge. The Cosmic Disk is, in fact, not a natural galaxy but was artificially created by Shaper activity. Even for such a race, a task of this scope takes incredible amount of time, energy and effort - as a result, the Cosmic Disk is incomparably smaller than other galaxies. Created by the attracting power of the Beacon World, it has only about 10 million stars and cc. 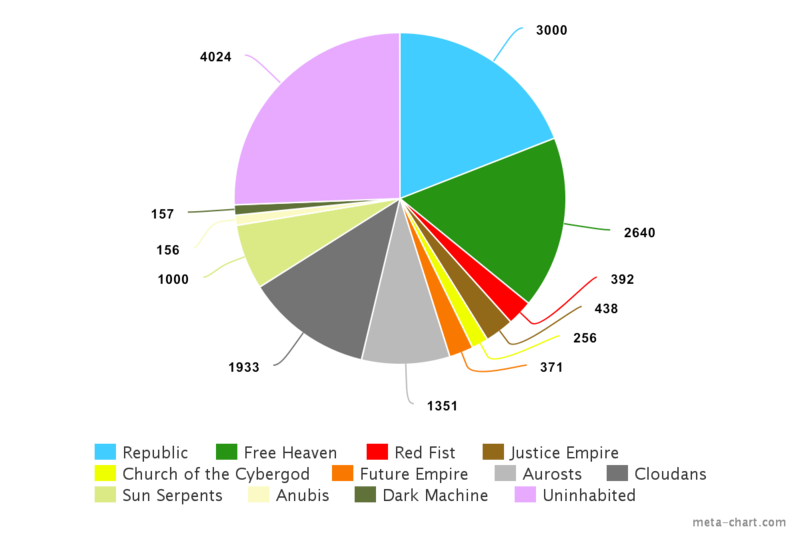 16 720 000 planets and moons overall - at least, this is the exacty amount of Planet Monuments in the galaxy. Because of the supernatural nature of the Frontier and the distorting force field of the Beacon World, and also considering the still unadvanced and nearly impossible tech level of interstellar space travel and heavy restrictions in interplanetary space exploration, there are only rough estimates about its size. Said estimations take between 400 and 10 000 light years, but these data, like the distance of other stars and galaxies can not be calculated for sure results. A Shaper construction within the middle of the Cosmic Disk, with the size of the supermassive black hole. Actually, it's an enormous hollow orb-shaped object. The interior can be approached through a Shaper Obelisk somewhere in the galaxy, but no one knows, where it is. This construction describes the entire web of Planet Monuments and randomly sends portions of this data through the universe. It should be noted that it emits an extremely strong red light pillar, making it visible in the entire Cosmic Disk. The edge of the Cosmic Disk; a chain of unidentified astrological objects, forming a mysterious space cloud. Planets in this region have harsh environment, while stars have extremely strong gravitational fields, making space travel even harder. For the Republic, it is considered the final edge of the area of interest. As of 7901.R.D., according to humanity's best estimation, there are over 1200 sentient or otherwise intelligent and partially or entirely civilized races living in the galaxy, as well as billions of different other forms of sub-species.